MIG / MAG Processes can be used for both joining and coating applications, whether for the protective coating of new parts or the build-up and repair of parts. The continuous electrode can be solid relying on gas shielding to provide both good metal transfer and protection of the molten pool. Alternatively, a metal or flux cored continuous wire is available. Both relie on additional shielding gas similar to solid wire. In particular, care must be taken in the storing of continuous electrodes to protect them from contamination, oxidation, rust, etc., causing feeding difficulties through the lining, and other harmful effects including increased electrical resistance at the torch contact tube. Damage through rough handling and inadequate storage may produce poor electrode feed, current fluctuations, control problems, oxide inclusions or porous deposits. For optimum results worn components should be cleaned and properly prepared prior to welding. Components which have been in service may exhibit damaged and / or fatigued areas. Fatigue cracks will more likely contain other contaminants. Damaged areas should be dressed by grinding or gouging. It is important that all contaminants be removed before welding. Sharp edges can be prepared by removing these areas to form a radius (this will reduce overheating and uncontrolled dilution). The MIG / MAG torch or gun unit includes the power lead, the shielding gas feedline, possibly the coolant, and the consumable. 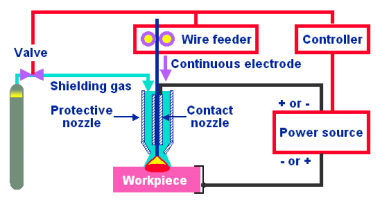 The welding current is transferred to the electrode by a sliding contact, in the contact tip. Up to 300 A the torch is normally gas-cooled. being water-cooled beyond that range. Both the shielding gas nozzle and the contact tip should be cleaned regularly and protected using anti-spatter compound. Regulate the wire speed via the wire speed potentiometer adjustable from 0 to 10, 15, 20 or more m/min. The motor of the MIG / MAG wire-feeder is powered by an adjustable voltage. The speed is therefore adjustable but constant during welding. The amperage adjustments necessary for stabilising the arc are made by the power source. The best dynamic is usually between two extremes. - When inductance is too high, correct droplet formation is hindered. - When inductance is too low: spatter may result. The inductance is set to the minimum (zero), to achieve dynamic balance in the arc. 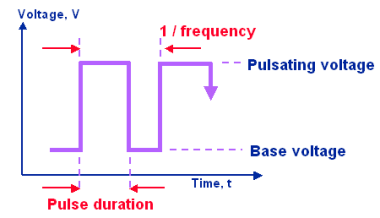 Pulse duration: A longer pulse duration increases the heat input, and also influences the diameter of the droplets in formation. Typical values: 1 to 15 ms. Frequency: Higher frequency increases the heat input, as well as the number of droplets transferred per unit of time. Typical values: 30 to 300 Hz. Wire feed speed: Higher wire feed speed has a particular influence on the deposition speed. Higher feed speed requires higher pulse frequency. The inductance is set to the minimum (zero). Perfect formation of the pulses requires limiting the inductance of the electrical circuit. Make sure never to coil the earthing cable or the cable assembly connecting the power source and the wire feeder. The earthing cable must lie parallel to the cable assembly, with a minimum distance between the two.